As discussed in bundle branch blocks, the bundle of His divides into the right and the left bundle branches. The complete right bundle branch block (RBBB) occurs when the right branch is not able to conduct the electrical stimulus. Therefore, the depolarization of both ventricles is performed by the left branch. The electrical stimulus travels down the left branch. First depolarized the left ventricle and the left two-thirds of the septum. Then, with delay, the regions of the right branch are depolarized. This delay in depolarization causes a widening of the QRS complex. 1. AV node and bundle of His. 2. Blocked right bundle branch. 3. Normal left bundle branch. Electrocardiogram features of right bundle branch block reflect the conduction disturbances. Lead V1: rSR’ morphology (broad R’ wave). Occasionally there is no S wave, presenting a broad and notched R wave. Abnormal repolarization. T wave inversions in V1 and V2. T-wave are deflected opposite the QRS complex 1. Tip: You just need to evaluate lead V1 and lead V6 to determine whether a wide QRS is a right bundle branch block. The interventricular septum is the first area to be depolarized. On the EKG it is observed as a small initial r wave in V1, and a small initial q wave in V6. After, the depolarization spreads to both ventricles, with a predominance of the left ventricle, producing a deep S wave in V1 and a tall R wave in V6. In right bundle branch block, the beginning of depolarization is similar. 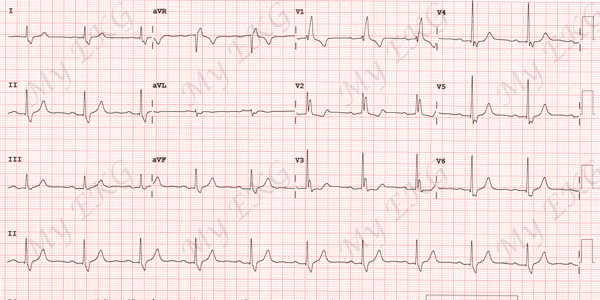 Disturbances occur at the end of QRS. The beginning of the QRS complex is equal to normal, (rS in V1 and qR in V6). But instead of ending, delayed right ventricular depolarization occurs, producing at the end of the QRS, a new R wave (R’) in V1 and a broad S wave in V6. Normal electrocardiogram: narrow QRS complex. Lead V1 shows an rS complex and lead V6 shows a qR complex. T wave is normal. Electrocardiogram with right bundle branch block: wide QRS (> 120 mseg). Lead V1 shows rQR’ morphology (broad R’ wave) and lead V6 shows qRS morphology (broad S wave). Abnormal depolarization of both ventricles also causes abnormal repolarization. T wave inversions in V1 and V2 are a characteristic finding in right bundle branch block. T waves are positive in leads V4 to V6 2. Tip: In right bundle branch block, ST-segment and T wave are deflected opposite the majority of the QRS complex (appropriate T wave discordance). 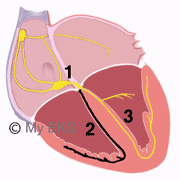 In young patients, right bundle branch block is not usually accompanied by cardiac disease. Medicines: betablocker, tricyclic antidepressants, difenhidramin, chloroquine, digoxin. Aberrant conduction or Ashman Phenomenon. Patients with right bundle branch block without associated heart don't need treatment. Patients who have right bundle branch block along with another heart condition, treatment of the heart condition is recommended. The association of right bundle branch block and left fascicular block may present a higher risk of complete AV block (read bifascicular blocks). Permanent pacemaker implantation is indicated for alternating bundle branch block (RBBB alternating with left bundle branch block)3 4. 1. Surawicz B, Deal BJ et al. AHA/ACCF/HRS Recommendations for the Standardization and Interpretation of the Electrocardiogram Part III: Intraventricular Conduction Disturbances. Circulation. 2009;119:e235-e240. 2. Goldberger A. Clinical Electrocardiography: A Simplified Approach. 7th ed. Philadelphia: Mosby Elservier; 2006. 3. Brignole M, Auricchio A et al. 2013 ESC Guidelines on cardiac pacing and cardiac resynchronization therapy. Eur Heart J; 2013. 4. Vardas PE, Auricchio A et al. 2007 ESC Guidelines for Cardiac Pacing and Cardiac Resynchronisation Therapy. Eur Heart J 2007; 28: 2256-2295.